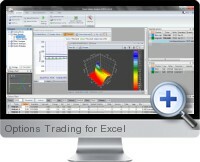 Options Trading for Excel (Visual Options) is a purpose built options trading system that integrates with Excel. Options Trading for Excel allows the downloading of market listed options data and performs accurate technical analysis in order to make informed option trading decisions. Options Trading for Excel utilizes one workbook for each option chain and outputs advanced charting and technical analysis. Ability to store and display options historical prices. Downloads ticker price data then calculates and charts various historical volatility trends. Overall portfolio valuations are recalculated as further options data is downloaded. Historical theoretical option prices are computed for specific option and strike prices and charts built with the values are automatically recalculated according to newly downloaded historical data for the ticker. Reports professional charts and diagrams showing both call and put options. Technical analysis and charts are provided for liquidity, volume, market and theoretical prices dependency, real volatility (market perception about the option and underlying stock), Greeks, open interest, historical theoretical price and many more. Charts and diagrams automatically connect data for various dates of expiration and options historical prices. Option prices can be calculated with account of commission of brokers: TD AMERITRADE, E*Trade, Schwab, Fidelity and Trade Station. Intuitive work flow and convenient navigation tools within the Excel workbook. "What if" analysis allows changing stock price and volatility values and analyzing the effect within the charts.